WASHINGTON — More than 18,000 activists will converge in Washington on Sunday for the annual conference of the American Israel Public Affairs Committee, as Democrats wrestle with the left’s rising criticism of Israel and as President Donald Trump seeks to divide his political rivals while bolstering Israel’s embattled leader. 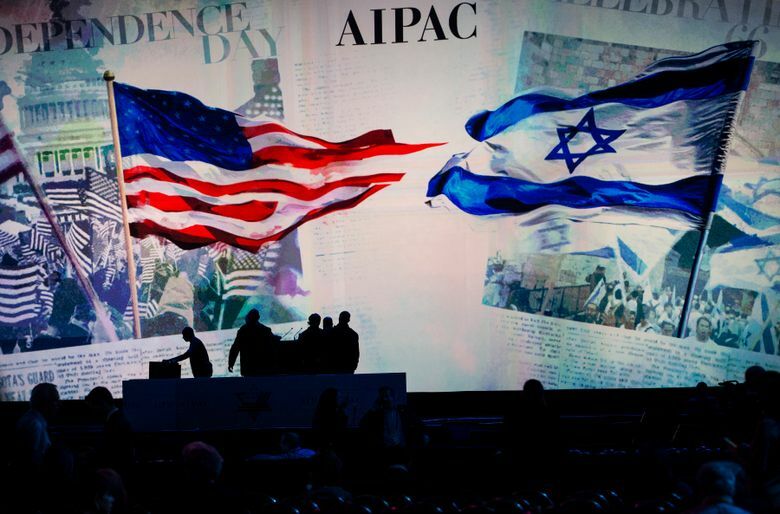 In some respects, the three-day AIPAC conference will look much as it has in years past. American and Israeli luminaries will speak, including Israel’s prime minister, Benjamin Netanyahu, Vice President Mike Pence, House Speaker Nancy Pelosi and Netanyahu’s main challenger in Israel’s election next month, Benny Gantz. It will wrap up Tuesday with a “lobbying day,” when thousands of activists will flock to Capitol Hill to press AIPAC’s legislative agenda. But this year’s confab is playing out in a changed and charged Washington political environment. Trump and his fellow Republicans have spent weeks lobbing accusations of anti-Semitism at Democrats, although the party remains the home of the vast majority of American Jews. And Democrats are under mounting pressure from their left flank to distance themselves from AIPAC, which aligns itself closely with Netanyahu’s far-right policies. A string of Democratic presidential candidates — Sens. Bernie Sanders, I-Vt., Elizabeth Warren, D-Mass., and Kamala Harris, D-Calif., as well as Beto O’Rourke and Julián Castro, among others — are skipping the conference. A group of freshman Democrats in the House, Reps. Ilhan Omar of Minnesota, Rashida Tlaib of Michigan and Alexandria Ocasio-Cortez of New York, has emerged as forthright critics of Israel and the United States’ policy tilt toward the Israeli government. Those trends will stand in stark contrast to Trump’s embrace of Netanyahu, who will meet the president for talks at the White House on Monday and at a dinner Tuesday. The swirl around this year’s conference represents “two new realities,” said Aaron David Miller, an expert on the Israeli-Palestinian conflict at the Wilson Center, a Washington-based foreign affairs research organization. The first is the deepening generational divide in the Democratic Party, which will be reflected in protests by progressive Jews outside the conference while older Democrats like Pelosi and Rep. Steny Hoyer, D-Md., the majority leader, address delegates inside. Trump might call Democrats “anti-Jewish,” but Jewish Democrats hold the gavels of some of the most powerful committees in the House — Judiciary, Appropriations, Foreign Affairs, Intelligence, Budget and Ethics — as well as the post of Senate Democratic leader. But a younger generation of Democrats is clashing with that old guard. The second is the divide in Israeli politics, which will be reflected in the competing speeches by Netanyahu and Gantz. Republicans will almost certainly use the conference to portray their party as the home for Israel’s supporters. Sen. Mitch McConnell, R-Ky., the majority leader, is expected to talk about legislative efforts to support Israel and to oppose anti-Semitism. Rep. Kevin McCarthy, R-Calif., the House minority leader, will tell conferees that “AIPAC should not be boycotted. AIPAC should be celebrated,” said his spokesman, Matt Sparks. Hoyer, the Democratic leader, will speak Sunday evening. He plans to remind his audience that the Jewish state and the U.S.-Israel relationship have “broad, bipartisan support because most Americans see them as integral to standing up for America’s values and our national security and interests,” according to a spokeswoman, Annaliese Davis. He will also “talk about what Israel and America have in common as fellow democracies,” and the threat posed by Iran. Trump announced Thursday that the United States should recognize Israel’s authority over the Golan Heights, a reversal of long-standing policy against accepting territorial changes acquired by force. The strategic area was seized from Syria in the Six-Day War of 1967. The policy-by-tweet was a valuable election-eve gift to Netanyahu. In the Senate, McConnell and his colleagues are eager to take concrete legislative steps to demonstrate support for American Jews — and to reignite a divisive debate that erupted this month among House Democrats, after Omar suggested that supporters of Israel were pushing “for allegiance to a foreign country.” That and other comments prompted the House to pass a resolution condemning all forms of bigotry, despite the wishes of veteran Jewish lawmakers who wanted it centered on anti-Semitism. Sen. Ted Cruz, R-Texas, has been circulating a resolution condemning anti-Semitism in isolation — a not-so-subtle effort to draw a contrast with the House. Cruz has also joined Sens. Tom Cotton, R-Ark., and Lindsey Graham, R-S.C., in proposing legislation to codify Israel’s authority over the Golan Heights. In the House, Rep. Jerrold Nadler, D-N.Y., moved last week to fulfill one of AIPAC’s legislative priorities: a congressional resolution opposing the boycott, divestment and sanctions movement, known as BDS, which is aimed, in part, at pressuring Israel to improve its treatment of Palestinians. But the resolution, which is nonbinding, is much weaker than another AIPAC-backed measure that the Republican-controlled Senate adopted last month. Founded more than 50 years ago to “strengthen, protect and promote the U.S.-Israel relationship,” AIPAC, which is bipartisan, is today widely regarded as one of the most influential lobbying groups in Washington. It does not endorse or donate to political candidates, though it encourages its members to do so, and maintains relationships with every lawmaker on Capitol Hill. This year, the organization’s activists will press Congress for the adoption of Nadler’s anti-BDS resolution, security assistance for Israel, enhanced cooperation between the United States and Israel in areas such as security and technology and a letter to the Trump administration about the threats on Israel’s northern border from Iran and its surrogates, an AIPAC official said. But there is evidence that AIPAC’s influence is waning, and its rightward tilt has strained its claims of bipartisanship. A number of Democrats in Congress have fled to J Street, a liberal Jewish political action committee that also bills itself as pro-Israel. MoveOn, the progressive advocacy group, urged Democratic presidential candidates not to attend the AIPAC conference this year. Some who have attended in the past, such as Harris, did not share why they are sitting this year’s conference out. But Sanders, who has not attended in the past, took the occasion to issue a strong anti-AIPAC statement through his policy director, Josh Orton. Orton said the senator was “concerned about the platform AIPAC is providing for leaders who have expressed bigotry and oppose a two-state solution” — an obvious jab at Netanyahu, whose recent pact with a racist anti-Arab party has prompted so much outrage in the United States and Israel that even AIPAC criticized it. IfNotNow, an advocacy organization of progressive young Jews, is planning protests under the #ResistAIPAC hashtag and has gathered thousands of signatures on a petition saying, “AIPAC doesn’t represent me as a Jew,” said Emily Mayer, a founding member of the group. Mayer said she had a message for Pelosi and the other Democratic leaders on the agenda.